Over the years, i've gotten so much better at packing for holidays! On numerous occasions in the past i'd be stood at the check-in desk frantically unloading half a suitcase into hand luggage to avoid a weight charge. I also realised that packing more, means less room for shopping! 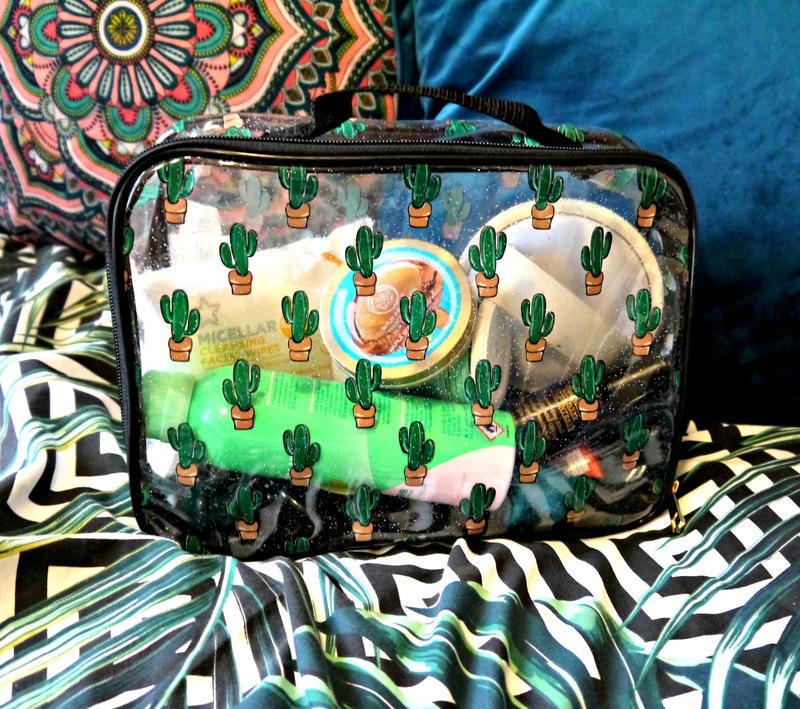 When it comes to my beauty bag, this year i've stuck to only packing the real essentials. 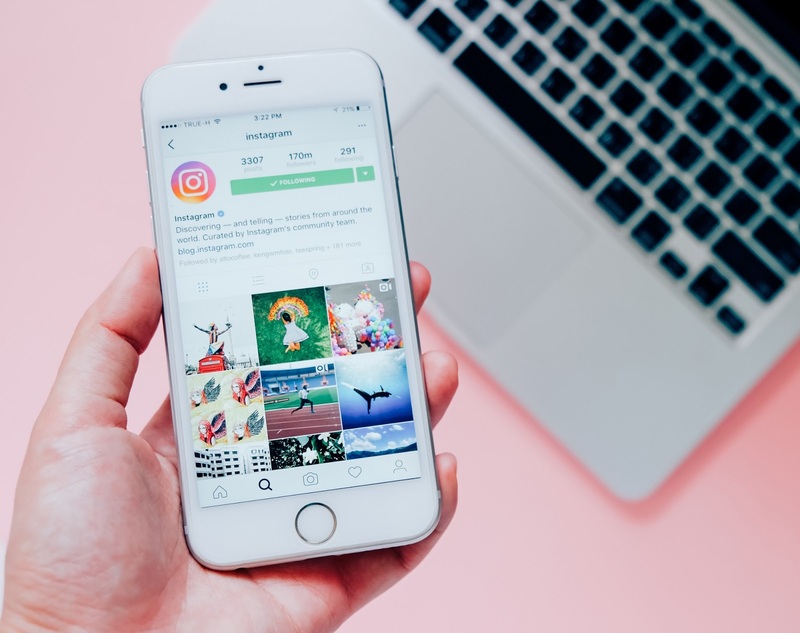 What's missing from the photos is my toothbrush, toothpaste and razor - simply because at the time of writing this, I need to head to town to buy them! Other stuff such as shampoo, conditioner and shower gel - we'll just buy when we get there to save on weight. The bag itself is from Primark - It was only a couple of quid and I instantly loved the cute cactus print and glitter perspex. It is a decent, deep size and holds everything for every occasion, from a weekend away to a holiday! I also like the little handle so you can haul it around from place to place more easily. I love coconut oil at the best of times, but I especially love it when i'm having a day at the beach. Before I head off, I dampen the mid-lengths to ends of my hair and apply a generous slathering of the Superdrug coconut oil. I then whip my hair up into a messy bun and throw on a head scarf. The coconut oil really helps to keep my hair soft and nourished, especially when it is prone to drying out in the sun. Once I have a shower, I shampoo it all out and repeat again the next day. It is also awesome as a masque if the sun, pool and sea have given your tresses a-bit of a battering. Hair oil is another vice of mine, I apply it every night before I go to bed. It has really helped me with frizz, as well as split ends and damage. As the bleach damage on my hair grows out, the mid sections are pretty ropey atm. 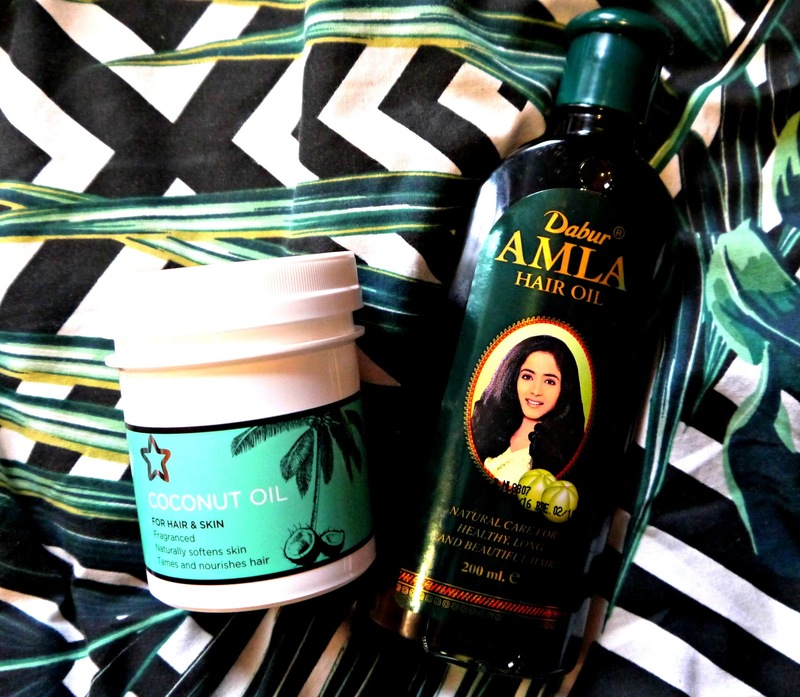 Whilst i'm not brand loyal, I have recently been dabbling with the Dabur Amla Hair Oil which I found in Superdrug. The oil is intended to promote long, healthy hair and according to Dabur, regular application can assist in split ends and minor hair loss. It contains extract of Indian Gooseberry (Amla) and other mineral oils. I like the smell of it and it leaves my hair looking shiny in a non-greasy way. Beach holidays are pretty sweaty occasions and deodorant for me, always has to be Mitchum. I am especially gleeful when I see it on offer in Superdrug. For me, Mitchum works the most effectively for and doesn't smell of that awful sickly scent most deodorants offer. I love the 'powder fresh' scent, it smells reminiscent of my favourite talcum powder scents - which is probably why I like it. 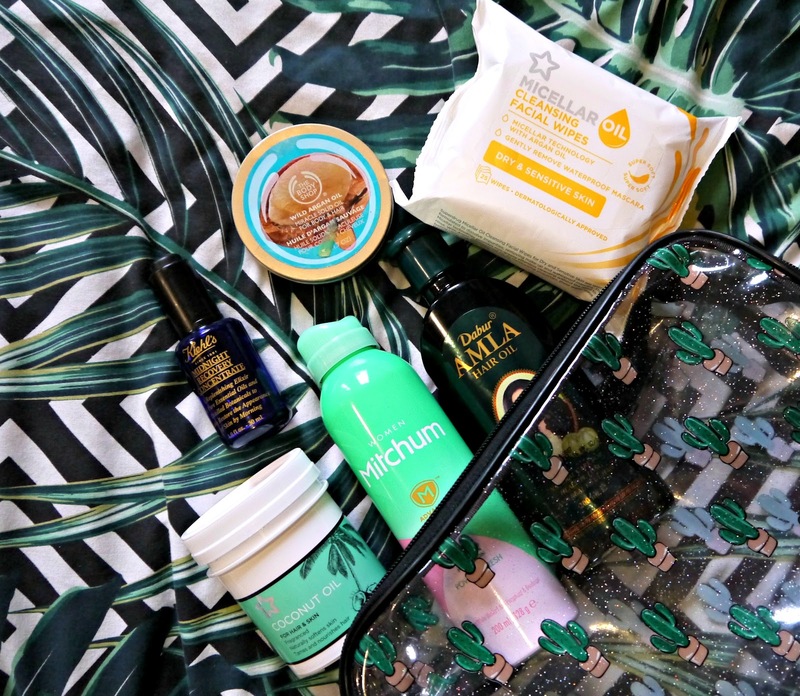 I couldn't mention a holiday beauty bag without mention of the Wild Argan Solid Oil from The Bodyshop. I apply it to the dry skin around my knee's and elbow's, on my lips, on my hair - pretty much everywhere. It is just one of those seriously diverse products that you can call upon for a multitude of purposes. I also like to have a pack of make-up wipes to keep my face feeling fresh. 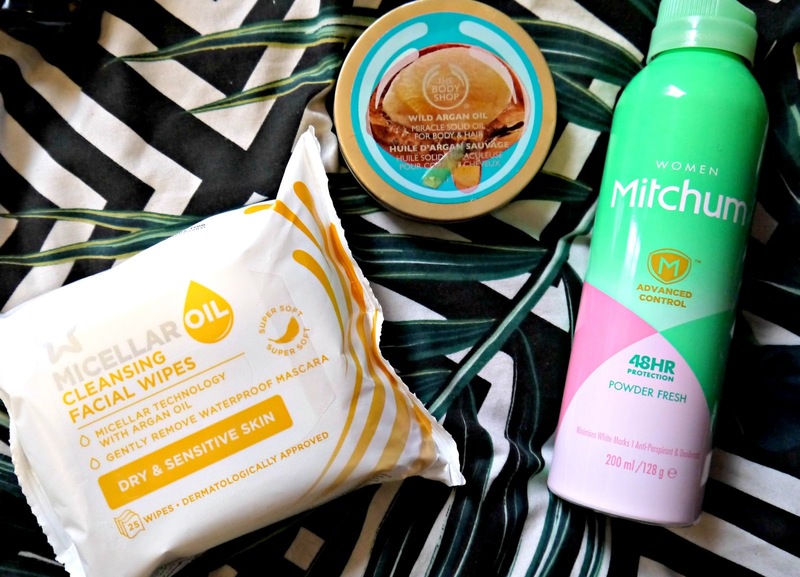 My favourites are the Superdrug Micellar Cleansing Wipes with argan oil. They're wet, non-drying and moisturising whilst fully capable of shifting stubborn make-up. 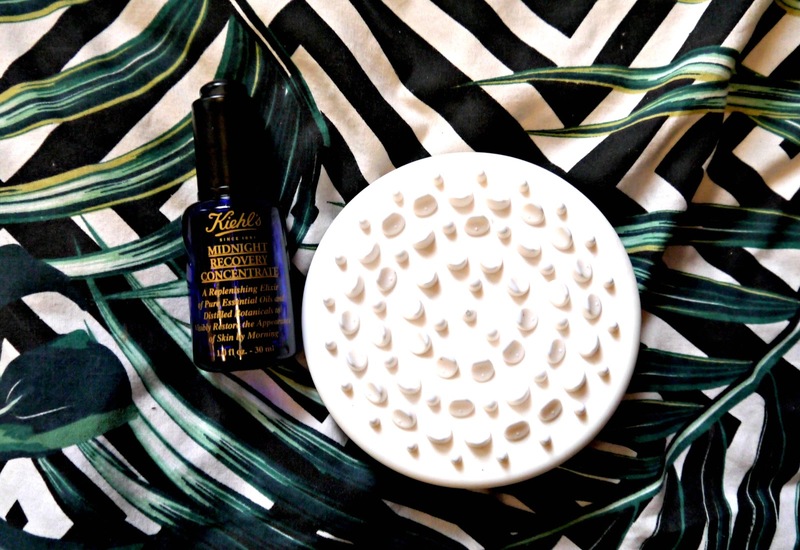 I love the midnight recovery concentrate by Kiehl's. I won't harp on about it too much, as i've previously done a full post about here. I do swear by it though and I think it is the perfect piece of skincare to take on holiday with me when my face might be parched from the sun. The second contraption on the photo above is a 'Cellulite massager' lol! I threw this in my bag knowing full well it barely has an effect. However, I figured that each morning a little buffing can't hurt before I whip on my swimwear and hit the beach! I never trust topical creams that claim to eradicate cellulite, as it's simply not possible - however a little manual massage teamed with exercise and a healthy diet must have some benefit right? What is in your holiday beauty bag?